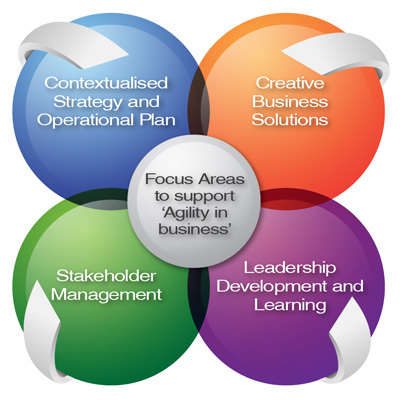 Based on our real life experience we have embraced a model that helps develop and supports ‘agile’ businesses. These are businesses that are effective, flexible and true to their strategy despite the current context of accelerating change and increasing complexity and interdependence. It is a context that calls for an ability to anticipate, strategise and respond rapidly to changing conditions; it requires a pro-active embracing of the volatility and uncertainty that characterises today’s business world. Contextualised Strategy and Operational Plan: A capacity to embed strategies and plans into the key present and future drivers of the business and commercial context, including framing and re-framing of initiatives and clearly describing desired outcomes as the environment changes. Creative Business Solutions: A capacity to encounter problems in a way that leverages the issue as an opportunity for improved competitiveness or performance. Stakeholder Management: A capacity to pro-actively involve internal and external stakeholders to initiatives in a way that secures support and collaboration, harnessing the success of the initiative. Leadership Development and Learning: A capacity to self-invent as a leader and create an organisation of ‘learners’ rather than ‘knowers’.